Hamburg will be looking to top the table with a third straight win as they entertain RB Leipzig to the Volksparkstadion. One drawback though. Centre-back Mergim Mavraj was sent off in the 3-1 win against Cologne on Matchday 2 and will sit this out through suspension. Attacking midfielders Aaron Hunt and Nicolai Muller, the team's biggest stars, are also out through injury. The last time Hamburg had three wins to kickstart the season was back in 1974/75. Leipzig had happy memories of their last trip here, winning 4-0 for what was their highest-ever Bundesliga away win. Summer signing Jean-Kevin Augustin, sold by PSG after the mega purchase of Neymar, will be looking to impress further. The Frenchman got two assists in the 4-1 thrashing of Freiburg before the international break. Timo Werner's good week continued Friday with another goal to help Leipzig defeat Hamburger SV 2-0 away in the Bundesliga. Werner, who scored twice in a man-of-the-match performance for Germany in a World Cup qualifier on Monday, sealed Leipzig's second win from three games with a quarter hour remaining. The visitors thought they had a penalty before the break when Deniz Aytekin pointed to the spot after Werner fell under Albin Ekdal's challenge. Aytekin consulted his video assistant, however. TV replays showed Ekdal got the ball before making contact with Werner's foot and the decision was reversed. 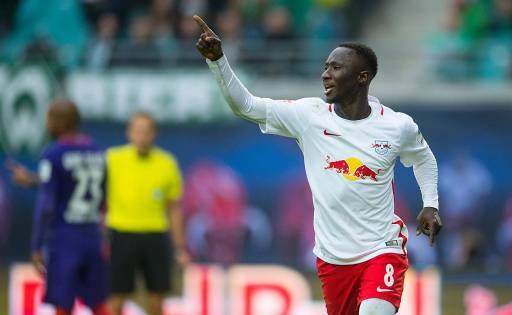 Naby Keita finally broke the deadlock with a fine strike from distance midway through the second half. Hamburg coach Markus Gisdol brought on Sven Schipplock for a defensive midfielder and the move almost paid off immediately when Peter Gulacsi produced a brilliant save to deny the Hamburg forward an equalizer. The home side was to rue the miss when Werner scored on the counterattack. Kevin Kampl sent the Germany striker through to race forward and the 21-year-old stayed cool in a one-on-one with the goalkeeper.